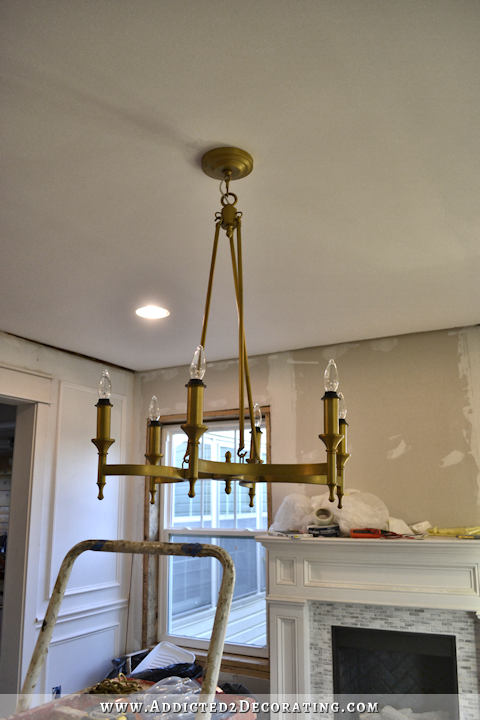 Yesterday I had two goals — get my ceiling primed and painted, and get my dining room chandelier hung. I’ve been so anxious to get that chandelier hung since it arrived, and I bought it in October 2014. Yep, fifteen months ago. So after messing with it for about 30 minutes, I finally decided that it would all straighten itself out once it was installed. 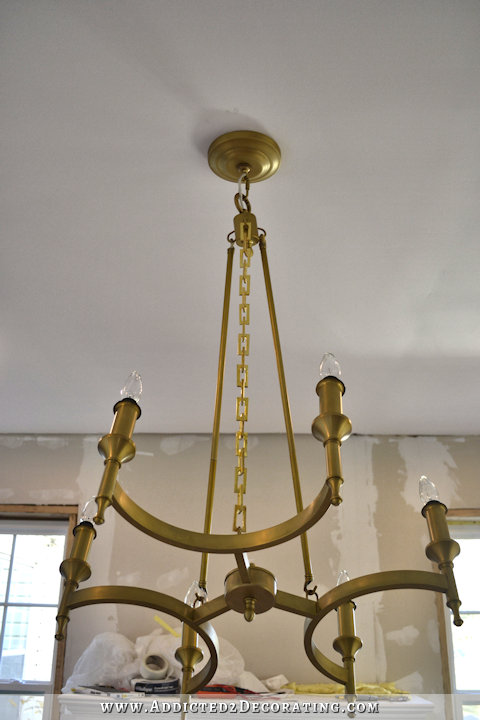 So I quickly did one more coat of paint around the chandelier area, and then got busy installing the light. Unfortunately, it didn’t straighten itself out. It was awful, and crooked, and unlevel, and no matter what I did or how long I messed with it, it just wouldn’t straighten out. But that wasn’t even main problem. The main problem is that I hung it as short as it would go (i.e., with absolutely no additional chain at the top), and it still hung way too low. Talk about frustrating! The fixture is listed as 32 inches high. My ceilings are eight feet high, so a 32-inch chandelier should leave 64 inches of clearance underneath, right? And that would have been perfect since a dining room chandelier in a room with an eight-foot ceiling is supposed to be 30-34 inches above the table, and a dining table is 30 inches high. I had it all planned out perfectly. Only this chandelier is NOT 32 inches high, and does NOT hang 64 inches from the floor. It hangs 56.5 inches from the floor, and that’s way too low. And of course, those metal rods aren’t adjustable at all. So some major frustration set in, and I started considering some different options. The easiest would be to remove the rods and just use antique brass link chain instead. That way I could adjust the height as I needed it. But frankly, that much plain link chain just seemed so boring to me. I finally decided that I would have to take the whole thing apart and take this top section (the section that the three rods attach to) to a welder and see if they would remove the big round loop on the top, and instead attach some sort of small hook that could attach right to the loop on the canopy. That would eliminate one more chain link, and would reduce the size of that huge loop. But at most, that would only reduce the height by two inches, and that still wasn’t enough. Remember yesterday I mentioned that I had already purchased rectangular link chain for the light I’m going to make for the music room? Well, I got that out to see if I could make it work on this chandelier. And you know what? I love it. It’s so much more interesting than just plain oval link chain, and it actually adds a modern touch to it. It’s a bit brighter and brassier than the chandelier, so I’ll have to tone it down some to match the chandelier. But I think it’ll look terrific once it’s all switched out. Unfortunately, I didn’t have enough since I only bought one yard, so I placed another order this morning for the rest. This is the chain I bought. It’s not cheap, but I had a heck of a time finding just the right chain. Most companies’ rectangular chains have links that are 2 inches long or longer. That’s huge! These links are just over 1.5 inches long. And I also only wanted the rectangular links without round links in between. And finally, I wanted unsoldered links, and most of the ones I found were soldered. So this was the only place where I could find smaller, unsoldered, all rectangle link chain. It should arrive next week, and I’m really hoping that I’ll like it once it’s all put together and hanging at the right height. But now I’m back to the drawing board with my music room light. I can’t very well use the same chain on that light. Or can I? I got it installed! It took a LOT of work and time, but I finally got it. After writing this post, I was still so frustrated with the light, so I was in the dining room staring at the light trying to figure out how to make it work (because even though I had a solution, I HATE waiting when I want something done). I noticed a little line on one of the rods, and upon closer inspection, I realized that the rods were actually two pieces screwed together and not one solid piece. One piece was 8 inches long, and the other was 16 inches long. So I took all three rods off, removed the short pieces, and just used the long pieces. I basically had to re-wire the entire top portion of the light (from the bottom of the rods up), and that’s where the time and effort came in. The manufacturer used the thick round wire, and getting that thick wire through the tubes and through that top part (the part with the three loops that the rods attach to) was incredibly frustrating, but I finally got it all rewired and put back together. Of course, removing eight inches from the rods made the chandelier too short, so I added a few links of the chain that came with the light, and now it’s the perfect height with 62 inches of clearance underneath! It’s still not sitting level. That thick wire running through one of the tubes throws everything off. But that’s a problem for another day. So, crisis averted. 🙂 I still need that other chain for the music room light, though. I didn’t order enough the first time, and unfortunately, it’s only sold in 1-yard increments. So how will you conceal the power cord that runs through that tubing? I would think you could use the same chain. The light itself will be totally different. There’s no way to cut the rod down and have someone re-sided the connector hookie? I had the same thought Tracy. 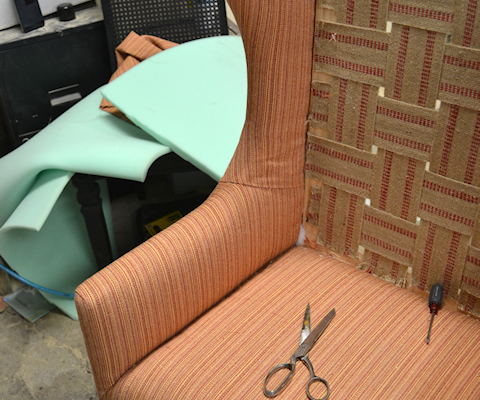 Shorten the rods – re-thread ends or whatever necessary to put it back together. I really like the cleaner look of the rods. (IMHO). It’s a shame the dimension specs were so far off! I thought the same thing. Cut the rods down and reconnect the end hooks. I like the rods better on this light. Maybe it’s just the mismatched tones instead of the chain design, but it seems off somehow against the lines of the rest of the chandelier. And I think using the same chain in both rooms is fine since the lights will be different designs. Agree. I think it’s at least worth a shot. Personally I really like the rods better than the chain. I agree – shorten the rods. I don’t mind the look of the chain so much (although it wouldn’t be my choice over rounded chain) it’s the fact that you would have to thread the wire through them that I really don’t like and I think that will detract from the look of the piece – as well as the chain. Right now the chandelier has such clean lines. If you’re going to the trouble of getting the top doodad adjusted then I would get the rods shortened as well. 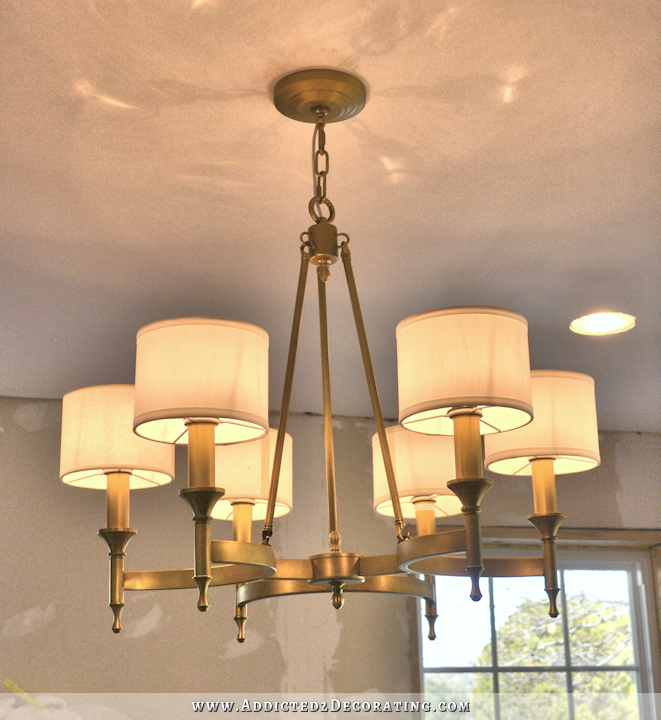 The bonus is that you don’t have to worry about whether the square chain on both light fixtures will be too much. I just had another look at the piece – and I really think the chain is not going to look great considering the wire appears only to run down one length. Definitely get the rods shortened. I agree with Tracy and every one else! it is a pretty light fixture, and if you take it to a welding shop, can’t they fix it for you? Like shorten the rods and figure out why it’s not hanging straight? I’m sorry you spent all that money just to get a big disappointment! First of all, I’m sorry your original fixture didn’t work out. As a true di-it-yourself ear, you found a way to make ir work and it will be great! I don’t know why you can’t use the same chain for both fixtures. Another tie-in ? Oh yes, although the lights would be different, the same chain would be a subtle nod to “linking” 😉 the two spaces together IMHO. Love that square chain! Maybe I’m just a cheapskate, but I’d probably be more pissed off that I needed to heavily modify at $500 light fixture. I don’t think I’ve ever spent over $100 for a light fixture in my life, so if I spent that kind of money on something I really liked and it was as disappointing as yours, I’d be pretty angry all around. Especially if it was listed incorrectly. But you’re not me. You’re you. And you see things like this as a challenge, not a failure. That’s why I read your blog…for inspiration. 🙂 Can’t wait to see how the fixture turns out! I was wondering why you just wouldn’t return it…. I don’t see why you wouldn’t be able to use the same chain there too. 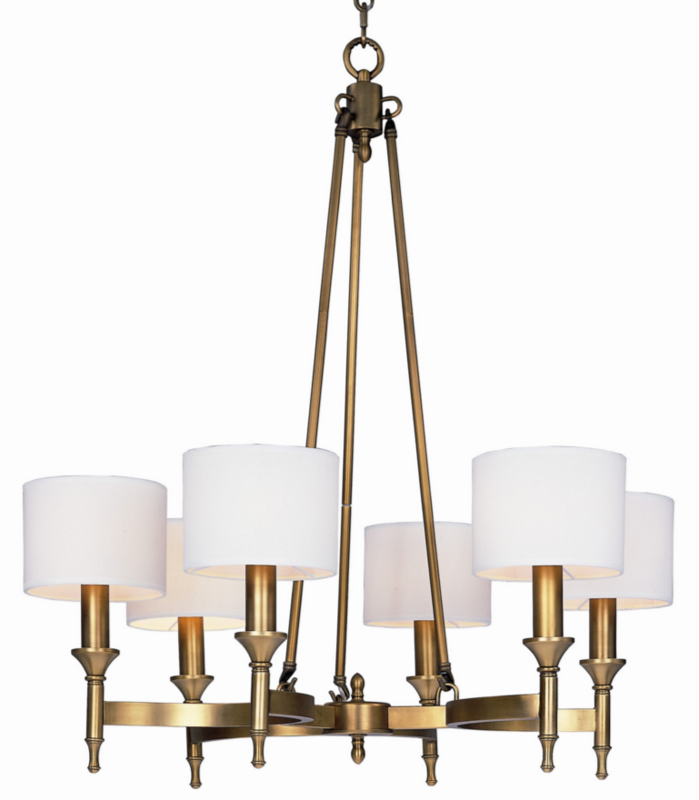 It will be in a slightly different tone and a totally different fixture, but will still carry a subtle link between the two rooms. Lol…now I understand why I sometimes see so many posts saying the same thing, they are probably posting at the same time! There were only 2 posts at the very beginning when I wrote my post right above. I guess we were all thinking similarly. 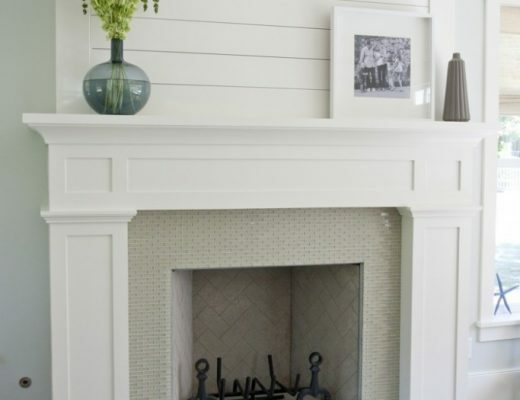 Yes, you can use the same chain in both rooms and it will be a lovely tie in! Very frustrating! We had the same problem with a huge retangular one for over our island. I think it is because the electrical wire threads up through only one of the rods and causes it to not hang right. But, it will look good when you get done. Least you forget or missed the post she has a diy budget that is allotted for things, her $$, her decisions. She’s trying to make it work as the time to return it has long passed. It’s a classic case of making lemonade from lemons. I say as much as its unfortunate, good for you for trying to still make it work! I like it better with the chain! I was wondering if you could cut the ends off the rods to the correct length and then run a really small chain inside the rods and attach the chain, but the rods would still be what you see? That way you can still have the clean lines of the rods, but the chain is really holding it all together. Moral of the story: When you buy something for future use or installation, check it so that it can be returned if necessary. I doubt they’ll let you send it back after this length of time, but I’d at least give it a try. I agree with Justin that it’s a shame to pay $500 for something requiring drastic adaption in order to be usable, especially since the vendor’s specs weren’t accurate, nor would it hang straight. I think the difficult (and tedious part) will be toning down the shine of the chain. I bought a kitchen sink 7 years before we actually remodeled the kitchen. (I knew it would be more expensive by the time I was ready to remodel, so I decided to get it while it was cheaper.) It sat safe and sound in my closet until it was at long last installed. After one year of use, the bottom of the sink began to craze; and now it looks so bad I need to replace it. It’s a well-known and respected brand, so this was a real surprise! Unfortunately, after 7 years–even though it was never in use–any warranty it might have had had already expired. Can I suggest you try it with the shades as well. I’m thinking that the chain might not look right once the shades are on as it’s quite a heavy looking light fitting and the rods were probably designed to balance it out. I think I’d go with the ‘try to shorten the rods’ team before going all out on the chain as the rods are all integral to the overall design of it. That chain once you have done your magic on it is going to look beautiful on that chandelier! And I one who says yes! You can use it for both rooms. I love it even more than then at first ! You are so clever! Yes you can use the same chain on the other light. I look forward to seeing what you do to your home. I’ve been exactly where you are. Isn’t that just the way life goes?!! Ugh!! I’d try to send it back just because the thing is defective and I’d want the people you bought it from to at least know it!! They probably won’t take it back, but, you never know until you try! See about getting the lamp wired with a more flexible gauge of electrical wire so the lamp hangs properly. 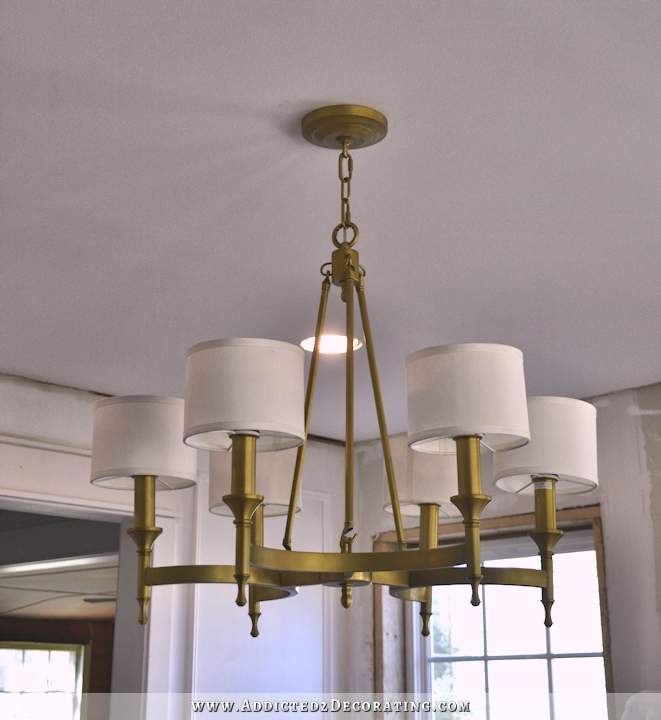 Have you thought about putting in a small round raised ceiling area-the width of the lamp or just a bit smaller, like a mini coffered area just for hanging the chandelier? That will raise the lamp to the height needed. I think shortening the rods will totally change the look of the lamp. Chain would be my fall back. Return this or use this one in a different area and buy a new lamp. The rods appear to have some sort of finial on each end and after the finial a hook. Could you use a pipecutter to shorten the rods?I’m thinking you could chop off the finial and hook at each end and then run some heavy duty cording (or fishing line or something) through the hollow core and attach the chandelier part back up to the base. It would take some doing to get it perfectly level, but then you could keep the clean lines of the rod. If you prefer the look of the chain, I see no reason not to use the same chain in both rooms. Sorry the dimensions were so far off and sorry you missed the return window. I’ve done that before! Ugh! Ignore the posters who are getting on you for spending $500 on a light. It balances out with the pendant lights that you made for your master BR, where you cut out millions of leaves! I’m replying to myself here. Or, if you want to go the rod route, could you buy some lengths of very narrow pipe and finish them to look like the chandelier and then use the same cording idea I mentioned above? Either way, I know you’re going to make it look great! Now there is a shock, indeed. I realize it’s probably too late to return it for a refund. It looks like you have a lot of work to do to remediate a $500 fixture. I’d be upset about that. 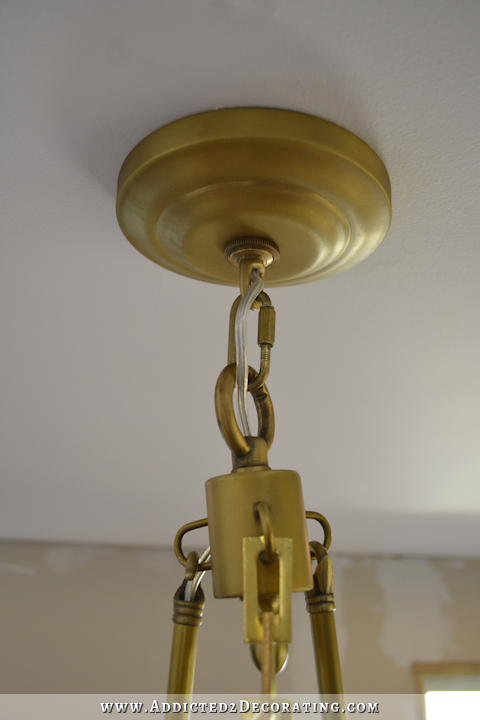 While I prefer the look of the rods, I think the chain solution could save you and result in a still elegant fixture. I hope you can try it out with all three lengths before you have to do something that can’t be changed. The reason I say this is that I am concerned that shortening the fixture so much may change the proportions in a way that doesn’t please you. I think the chain solution could look fine, but I would definitely prefer it if you could paint the chains to match the rest of the chandelier. Which will probably mean painting the entire fixture to get an exact match. Good luck! Yay! You figured it out! So glad! One thing I see that is making it hang crooked, is the professional photo does not have the wire threaded through the tube, so no problem with hanging straight. When the wire is threaded though, however, it creates a problem. Figure that out and it will hang straight. As for the chain vs tubes, I like the tubes much better. They belong there. See if your welder can shorten them and then reattach the hooks. I caught your update and am glad you figured it out! It looks beautiful. You are almost finished with the dining room! I am excited to see it with the trim and paint! I like those rods waaaayyyy better than the chain. Good job! The short rods look better, to me, anyway! So, yay for you! 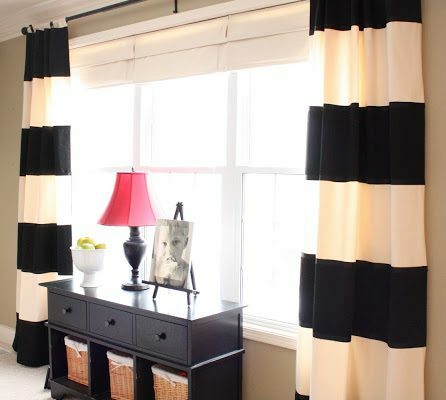 It looks so great with your room! And, the light plays off of your ceiling beautifully! Girl, you got this…..you always figure a way out of any situation…..I’ve said it before and I’ll say it again….you’re amazing. Carry on!!!! I agree with all those who say keep the rods! Much cleaner, smoother, elegant line to the whole thing. The business of the chain is distracting and on a spendy fixture you don’t want the focus to be on the chain that wasn’t meant to be in the first place. There should be a fabricator who can cut down those rods and reconnect the end caps. It’s a lovely fixture! I looked at the light on the site you got it from, and if you look at the closeup, I noticed that two of the rods had the longer sections going one direction, while the third rod went in the opposite direction. ( you can see the spot where they join ) I know you are only using the longer sections, but wonder if one needs to be flipped upside down for the thing to hang level? Don’t know how that would affect things, but thought I would mention in case it does. Lovely chandelier, by the way! I think the light looks beautiful with the shorter rods. Good choice. I always unbox things as I get them to check if there will be a problem. Unfortunately it took me more than one disaster to figure this out. Good work as always. Love your blog. Your decorating project goes like mine usually do! Good thing you have the gift of creativity! I love your new light! Contact the manufacturer about the leveling problem. They may have an easy answer which saves you from more frustration. She meant the rods come in two pieces each, and crew together to make long pieces, or you can use them separately for a shorter length. So, six pieces, and you can combine a short and long to get a super long chandelier, or use three rods ( either the shorter OR longer ) for the length you want. I love that you bought yourself the light fixture that you wanted. After all the money you’ve saved diy’ing you’ve certainly earned the right to indulge in that perfect piece every now and then. I’m sorry you had to go so to much trouble to get it to hang at the right height, but I’m glad it worked out and I’m thankful you shared the process with your readers. Sometimes I feel like we have the worst luck with projects that “should be easy”, but I can see from your experiences that everyone has just as many setbacks and that’s just part of the process. I have a chandelier on a dimmer switch! I have all old style light bulbs. Do they make bulbs now that are high efficiency for dimmer switches? Help!!! Yep! You can buy dimmable LED bulbs. You just have to be sure they’re labeled “dimmable” on the package. Will you please measure the height and the width of the shade and let me know what they are? Am looking for this shade in a special size and this looks as if ut is the perfect size. Love everything you do. Suggestion: at the very top where you have added links, I believe you should be weaving the wire in and out of the links and if you pull the wire taught you may see that it will level the fixture. Does anything ever go smoothly? Not for me. I’m glad you have it mostly figured out now, as it looks GREAT! And you are a saner woman than I… I would have pulled all my hair out, lol.